The Iranian revolution of 1979 also provked a war of clashing ideologies, a war between good and evil as some would call it. At the time of Darius the Great a similar pattern was in motion once the line of Cyrus was no more. Darius the King says: These are the provinces which became rebellious. The Lie (druj) made them rebellious, so that these (men) deceived the people. Afterwards Ahuramazda put them into my hand; as was my desire, so I did to them. 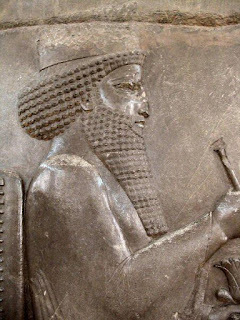 Darius the King says: You who shall be king hereafter, protect yourself vigorously from the Lie; the man who shall be a Lie-follower, him do you punish well, if thus you shall think, "May my country be secure!" Darius the King says: This is what I did; by the favor of Ahuramazda, in one and the same year I did (it). You who shall hereafter read this inscription let that which has been done by me convince you; do not think it a lie.